Techniques that can noninvasively and dexterously manipulate cells and other bioparticles (such as organisms, DNAs, proteins, and viruses) in a compact system are invaluable for many applications in life sciences and medicine. Historically, optical tweezers have been the primary tool used in the scientific community for bioparticle manipulation. Despite the remarkable capability and success, optical tweezers have notable limitations, such as complex and bulky instrumentation, high equipment costs, and low throughput. 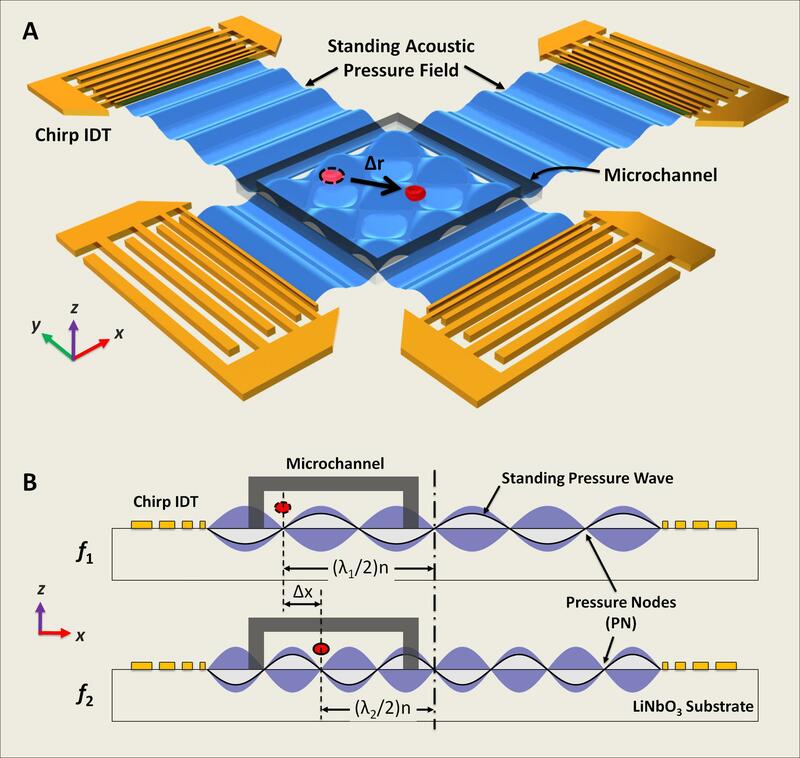 To overcome the limitations of optical tweezers and other particle manipulation methods, we have developed a series of acoustic-based, on-chip devices (Figure to the left) called acoustic tweezers that can manipulate cells and other bioparticles using sound waves in microfluidic channel. Cells viability and proliferation assays were also conducted to confirm the non-invasiveness of our technique. 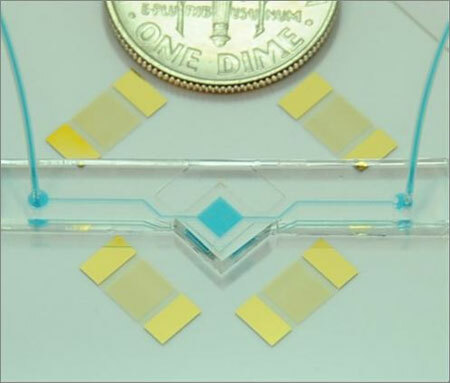 The simple structure/setup of these acoustic tweezers can be integrated with a small radio-frequency power supply and basic electronics to function as a fully integrated, portable, and inexpensive cell-manipulation system. Along with my colleagues, I have demonstrated that our acoustic tweezers can achieve the following functions: 1) single cell/organism manipulation ; 2) high-efficiency cell separation ; and 3) multichannel cell sorting . The acoustic tweezers I developed was the first acoustic manipulation method which can trap and dexterously manipulate single microparticles, cells, and entire organisms (i.e., Caenorhabditis elegans) along a programmed route in two-dimensions within a microfluidic chip . 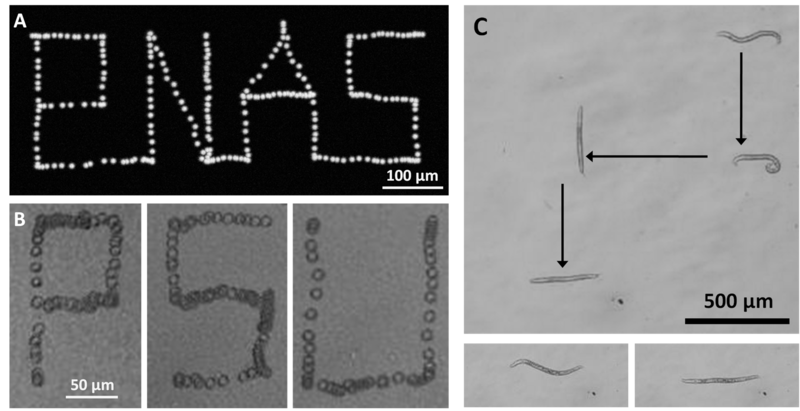 We demonstrate that the acoustic tweezers can move a 10-µm single polystyrene bead to write the word “PNAS” and a bovine red blood cell to trace the letters “PSU” (Figure to the right). It was also the first technology capable of touchless trapping and manipulating Caenorhabditis elegans, a one-millimeter long roundworm that is one of the most important model systems for studying diseases and development in humans. To the best of our knowledge, this is the first demonstration of non-invasive, non-contact manipulation of C. elegans, a function that is challenging for optical tweezers. Simple and high-efficiency cell separation techniques are fundamentally important in biological and chemical analyses such as cancer cell detection, drug screening, and tissue engineering. 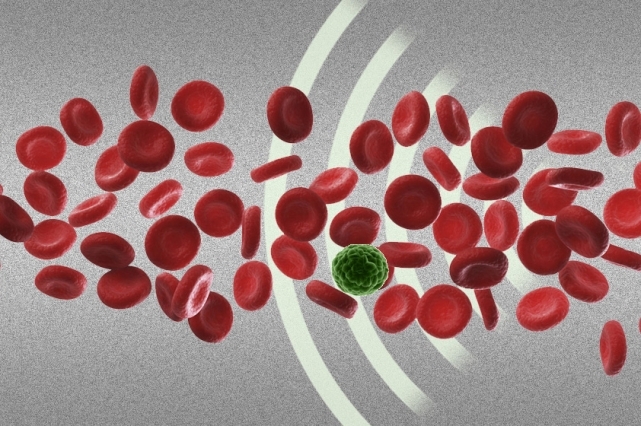 In particular, the ability to separate cancer cells (such as leukaemia cells) from human blood can be invaluable for cancer biology, diagnostics, and therapeutics. We have developed an standing surface acoustic wave based cell separation technique that can achieve high-efficiency (>95%) separation of human leukemia cells (HL-60) from human blood cells and high efficiency separation of breast cancer cells from human blood based on their size difference (Figure to the right). This method is simple and versatile, capable of separating virtually all kinds of cells (regardless of charge/polarization or optical properties) with high separation efficiency and low power consummation. Cell sorting is essential for many fundamental cell studies, cancer research, clinical medicine, and transplantation immunology. I developed an acoustic-based method that can precisely sort cell into five separate outlets of cells (Figure to the right), rendering it particularly desirable for multi-type cell sorting . Our device requires small sample volumes (~100 μl), making it an ideal tool for research labs and point-of-care diagnostics. Furthermore, it can be conveniently integrated with a small power supply, a fluorescent detection module, and a high-speed electrical feedback module to function as a fully integrated, portable, inexpensive, multi-color, miniature fluorescence-activated cell sorting (μFACS) system. 1. 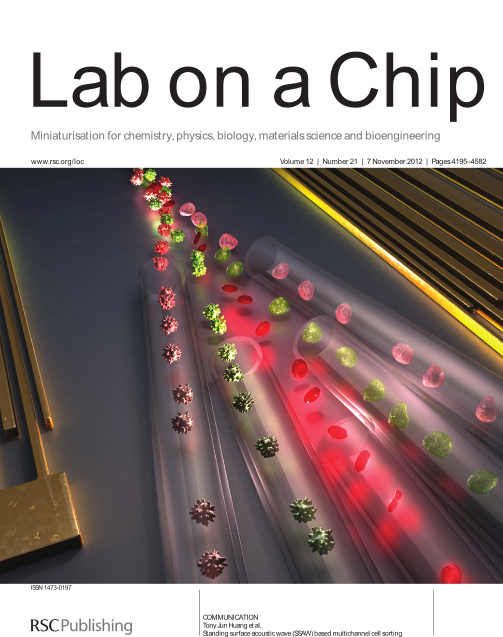 Xiaoyun Ding, et al., On-Chip Manipulation of Single Microparticles, Cells, and Organisms Using Surface Acoustic Waves, Proceedings of the National Academy of Sciences of the United States of America (PNAS), 2012, 109, 11105-09,. Xiaoyun Ding, et al., Cell separation using tilted-angle standing surface acoustic waves, Proceedings of the National Academy of Sciences of the United States of America (PNAS), 111, 12992-12997 (2014).